Langa-based international star, traditional African music performer and ethnomusicologist Dizu Plaatjies in action in full regalia. Dizu Plaatjies’ star shines brightly in South Africa and has done so since way back in the ’80s when he formed his band Amampondo in Langa. Yet, his status internationally is far brighter and continues to grow as music lovers across the globe embrace, more and more, the genre that has become known as “world music”. Check out this statistic: Dizu has travelled abroad, over the years, a phenomenal 84 times according to his passports. And he has a bundle of those documents. He is still trying to work out how many countries he has been to – but it’s a lot. From afar, I view the music landscape in Cape Town and, to a lesser degree, South Africa. It always seems to me that Dizu doesn’t enjoy as high a profile in his hometown and SA for a performer who has plied his trade for more than 40 years starting with Amampondo. I’d hazard a guess that were I too run a vox pop among the music lovers on the Cape Flats – excluding Langa and Gugs – I would not find too many who would know who Dizu Zungula Mzikantu Plaatjies is. From a peculiarly (and sadly) South African view, with a name like Plaatjies it would not be unreasonable to assume he is part of the “coloured” community. For Dizu, the answer is quite simple: “I am a South African. Dizu’s manager, might not go along with my take on his popularity but – 20 years on from the new South Africa – could it be that what is “hot” in Langa and Gugs doesn’t really permeate onto the broader Cape Flats? In fact, while Dizu enjoys a certain status in the Peninsula, the irony of it all is that Dizu is probably better known in France and some other countries in Europe than he is in South Africa. Much like the early days for Abdullah Ibrahim and Jonathan Butler. Dizu, now 56, came to Cape Town from Lusikisiki in Pondoland as a child and schooled in Langa. He says his interest in music started with diviner ceremonies with his father, a traditional healer, and participating in entertainment events in Langa, be it as a deejay, performer or just involved in the arts generally. “I first played with my friends as part of the manhood school jams before getting Amampondo together,” he says. “Our gigs were confined to the townships and the streets of central Cape Town and focussed mainly on traditional African music and jamming as drummers. Although Dizu categorises his music as neo-traditional, which is what is gaining all the plaudits, he says he plays “happy music, music for different moods, and music with real roots in southern Africa” and he doesn’t believe working with other genres to broaden his appeal compromises his music values. 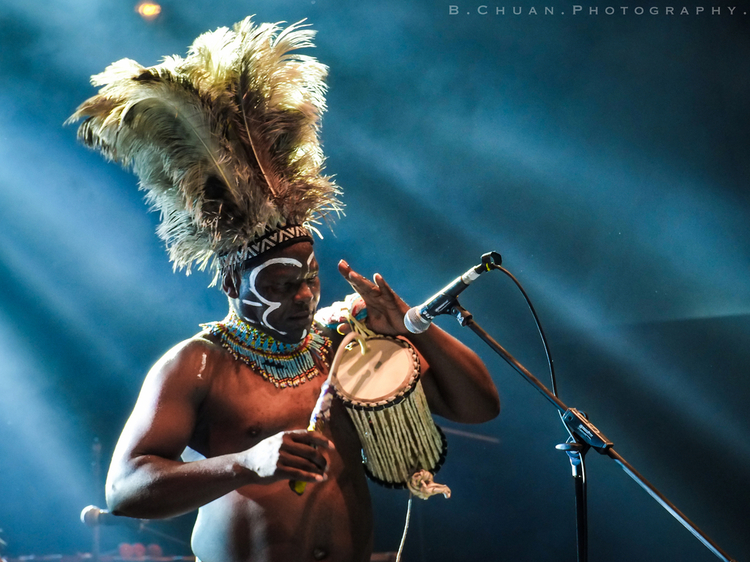 Much of the performances focus on African rhythms through percussive sounds and traditional string instruments. 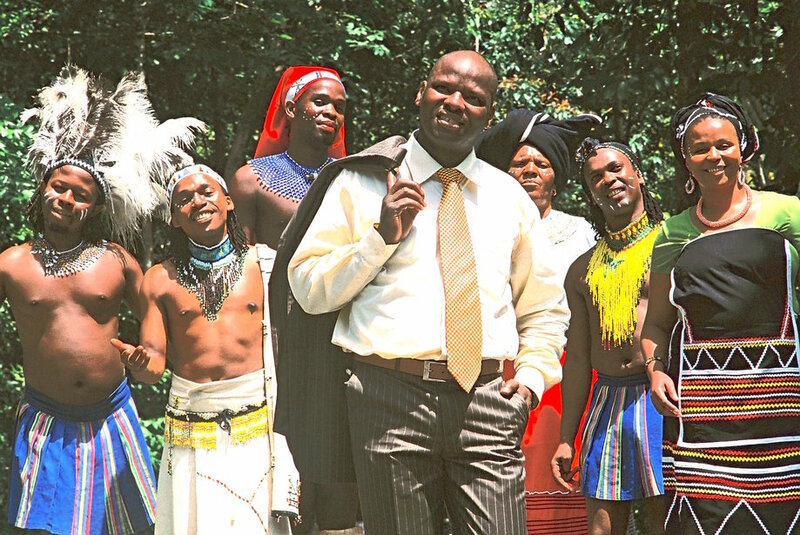 Dizu and the group The Amampondo Drummers broadened their horizons in 1983 when they did a gig in Grahamstown and then moved on to Johannesburg where a stint at the Market Theatre proved to be their big breakthrough. At that venue, the art/theatre audiences proved to be more discerning and appreciated their performances as more than just busking. They sat up and took notice of musicians playing traditional music using appropriate instruments. A search on the Internet and social media paints a pretty clear picture of how the Dizu Plaatjies appeal spread. It is peppered with reports of gigs in the States, United Kingdom, the Continent, Asia. A veritable everywhere man. He would have myriad tales of the highlights of his travels but the one that stands out would be the concert for Mandela in London. “That was in 1988 and we played at Wembley Stadium for Mandela’s 70th birthday,” Dizu recalls. “We donated all the money to the Anti-Apartheid campaign and then the ANC boycotted us. “There was the cultural boycott and we had to ask permission from the politicians to go perform overseas. In 1989 we went to Taiwan, Japan, Australia, USA and Canada and they did not like that, but they were doing nothing to help pay the rent at home. “Even after 1994 the politicians did nothing to support the musicians who did bow down to them. It was like a reverse of Paul Simon’s problem. We were the ones suffering from apartheid and they did not care. “We travelled overseas a lot during the apartheid years. We didn’t sit and wait for things to happen and we did not experience what most of the artists back home had to endure. On Dizu’s Ubuntu – The Common String album, he has a composition that pays tribute to the black consciousness icon, Steve Biko. “Biko was an outstanding person. I heard him speak at our school and I met him in 1976. He really impressed me. He told us that we have to look after ourselves and that when he was free, we would be too. The Ubuntu album featured a variety of instruments that could hardly be regarded as mainstream. Among others, Dizu plays an uhadi and an umrhubhe (both African mouth bows). Then there’s Nceba Gongxeka on Ugandan bow harp, and bass marimba; Nicolas Gongxeka on Ugandan bow harp and tenor marimba and Kim Masala on soprano marimba. It’s a seminal work, but has it achieved the recognition it deserves? His management team says it has and produced tha facts to back it up. It spent five months in the Transglobal World Music Charts – four of then in the top 10. The album was selected as a Top of the World album by Songlines Magazine, the British world music “bible”. He also was given a double-page spread in Folker – the German roots music magazine. As can be expected, Dizu’s political acuity is quite high. He now lectures as an ethnomusicologist at the University of Cape Town (he has worked there for 25 years) and he says his performances centre on raising cultural awareness and tolerance of other cultures. Does it also extend to raising political awareness? He is quite concerned though that there is now no support for culture at any level: government, municipal and even NGOs. “They are hung up on amateur events and don’t have a plan for sustaining professional cultural players,” he says. All of which, he says, makes his job harder, as an ethnomusicologist, to open the minds of the younger generation to music of the ancestors. After Amampondo, Dizu created the Ibuyambo Ensemble focussing on traditional music but embracing other influences. His next project, he says, could be going back to ancient classical songs. It helps being able to play the traditional wood instruments of his ancestors. There is a school of thought among Cape Town performers that the preponderance of black American music has, in a way, stymied the development of a definitive local style. Dizu agrees that the USA influence is big but admits, “I like jazz”. Talking about mbaqanga, township jive (jiet) and ghoema, Duzi says: “We do have a heavy link to ghoema, we have those rhythms. There is a strong connection and it is hard to say where one stops and the other starts. “One would translate ghoema as ‘high life’ music. You’ve got to move your feet. Do something with your feet. It is music composed by happy people even if other things have frustrated you. He is encouraged by the younger generation who now have the opportunity to equip themselves with tertiary-level music education but has some disquiet about what awaits them when they have obtained their degrees. “Arts can only develop when there are places to play. There may not be enough gigs for all the graduates, and that is a problem,” he says. He has rubbed shoulders with some of finest musicians over the years and those he admired most have all departed this mortal coil – Robbie Jansen, Chris Ngcukana, Miriam Makeba, Hugh Masekela, Sipho Gumeda. And, as a music lecturer, he has trained the likes of Jimmy Dludlu, Judith Sepuma and Buddy Wells. His courses are extremely popular with students coming from as far afield as the States and Scandanavia. Dizu was delighted with the recent SABC ruling that stations should reflect 90 per cent local content. His work these days involve corporate gigs (because that is where the money is) and the occasional overseas performance with a five-piece or seven-piece band. There was a time when he would do trips to France at least three times a year, doing cultural events. 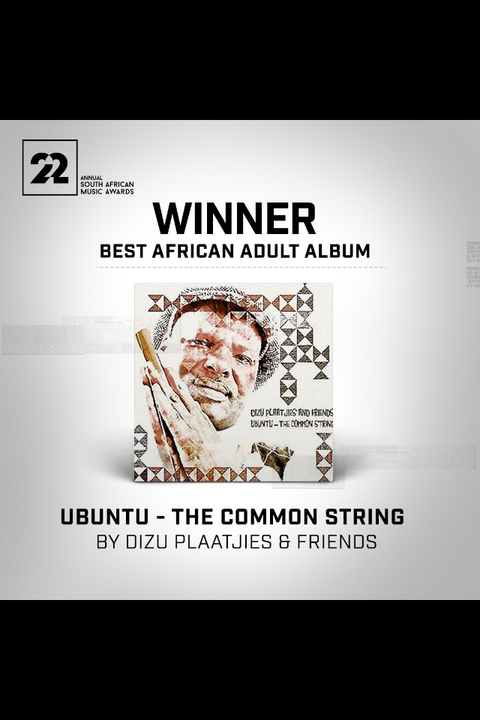 Recently Dizu won a SA Music Award (the SA equivalent of the Grammys) for his Ubuntu – The Common String album. It won the Best African Adult category. Dizu Plaatjies is not a pop musician and it’s not about fame in SA for him. If, in the end he doesn’t get the full recognition he deserves from the general music lovers, he certainly gets it from other musicians. The SAMAs are voted on by his peers. 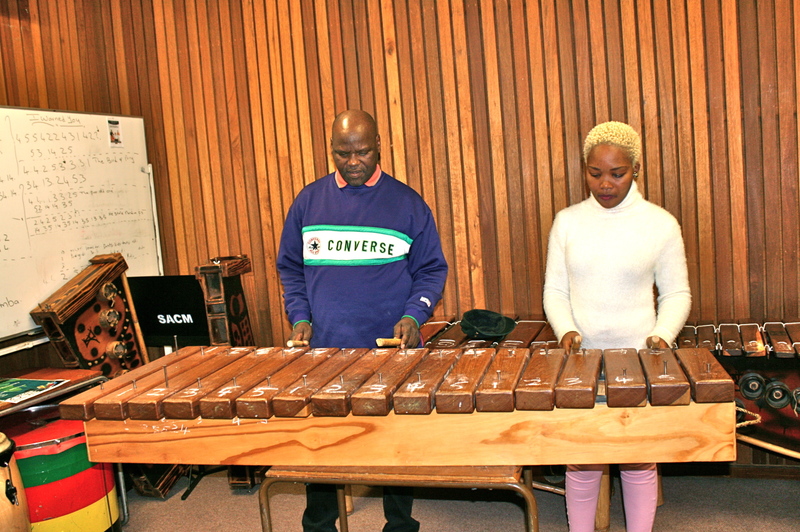 Dizu Plaatjies at work at UCT Music School with student Noxolo Zenzi who has been studying African vocals and African jazz for five years. This work is copyrighted. Permission has to be obtained to reproduce any part of it. Thanks Warren . We really appreciate the biographies you write and you put so much love into what you do. Thanks Warren, agree he is better known in Europe but he is pretty important in the more serious music scene in SA too. Proud of you Dizu and mampondo…i remember up on the roof(Braamfontein)..Soweto,and the gigs @ the Market..influenced my songwritting.thank you Dizu,for making C.T n S.A. proud. I love playing his music and telling his story on my radio program, eastsidefm.org in Sydney, Australia. I’m originally from Cape Town.